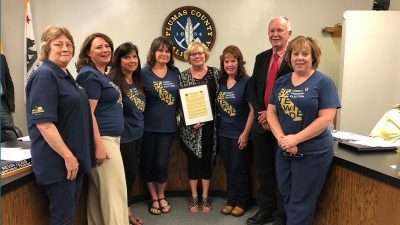 The county said goodbye to two long-standing employees and hello to a new fiscal budget at the Plumas County Board of Supervisors meeting June 19. The board recognized attorney Robert Zernich for 32 years of service as a public defender. Zernich will be retiring from the public defender’s position, but will continue taking cases as a private attorney. Supervisor Lori Simpson recognized Zernich for his many contributions to the county, both professionally and personally. Other employees of the county, like Sherriff Greg Hagwood, also spoke and praised Zernich for his many years of professionalism and hard work. The county also lost a long time employee with the retirement of Melinda Rother. Rother was the Assistant Clerk-Recorder, and she retired after 20 years of service in Plumas County. Simpson read a Resolution of Appreciation approved by the board. The resolution mentioned Rother’s hospitality and exceptional service to the county. 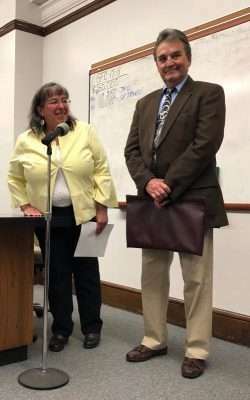 Other county employees, including the teary-eyed group of women who all work in the county clerk-recorder’s office, praised Rother for her work. “I mostly want to thank the staff that I have been with for 20 years. They are the best and I will miss them greatly,” Rother said. The board adopted the recommended budget for the 2018-2019 fiscal year. Despite an estimated $3.1 million shortfall in the projected budget, the board approved it with little discussion. Budget consultant Susan Scarlett presented the figures for the board to review. Scarlett said the $3.1 million shortfall is almost $1 million less than the previous fiscal year. Also, the county’s reserves are above $7 million, well above the recommended amount of $4 million, which makes the reserve fund well equipped to make up the difference in the $101 million spending plan. 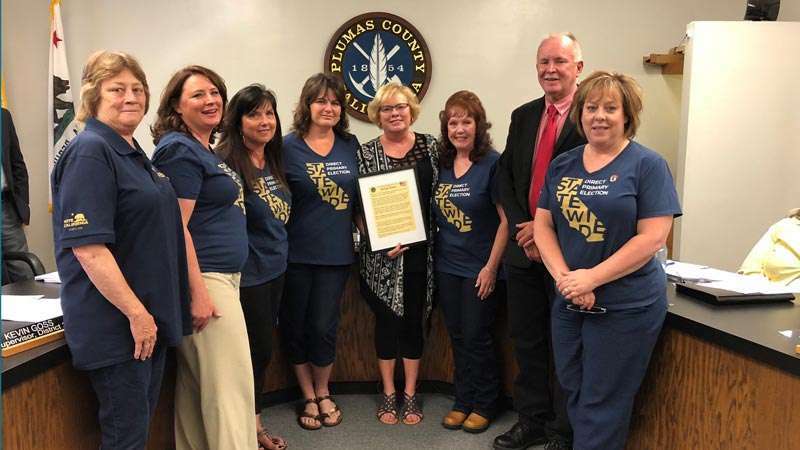 The ladies from the county clerk’s office and Supervisor Jeff Engel pose next to Melinda Rother, the assistant clerk recorder, who is retiring after 20 years of service to Plumas County. Pictured from left: Sue Clift, Lori Mundorff, Lori Powell, Marcy DeMartile, Rother, Kathy Williams, Engel and Julie Hagwood. The new budget has a variety of new expenses coming from the jail and sheriff’s office. Though the two departments requested the highest amounts compared to other departments, they both have the largest budgets, which means the requests were still only a small portion of their operating costs. One aspect of the new request for funds has to do with the fully funded medical services the jail will be able to provide for inmates. In a different agenda item at the meeting, the board approved an increase of more than $270,000 to go toward medical contracts to care for the patients. There will be new projects in the facilities department to help bring county buildings up to fire safety code, and the new county administrative position will have anticipated increases to the previous budget. There are also a few increases to departments’ budgets due to the recent raises to department heads awarded in the past few months. Some counties are charging 10k plus for Commercial cannabis licences.